It’s a creamy, chocolatey, sweet cherry pie that just melts in your mouth. Because the only thing better than melted chocolate is combining that chocolate with a fresh, juicy strawberry. These Sweet Chocolate Cherry Bombs taste like chocolate-covered cherries, but with much more chocolate flavor! The insides of the balls are soft and moist, which goes really well with the juicy maraschino cherry placed in the middle of each. Covered in a chocolate shell, these bombs are a perfectly poppable (and romantic) dessert! What is it about the simplicity of chocolate covered fruit that makes us all smile? 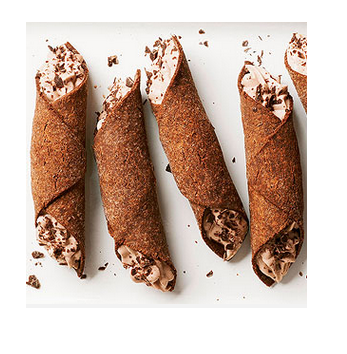 Who doesn't want a chocolate cannoli? Just like hot chocolate, only cold!